The latest bumper edition of The Network is out now. 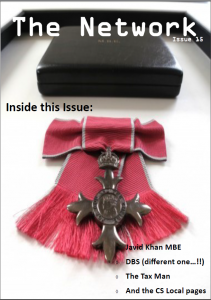 In this issue, Javid Khan from the Department for Work and Pensions, tells us all about his royal appointment at Buckingham Palace; there's a 'Focus On' from the Defence Business Service including insight from the Head of People Change and Development, Ben Kinley; and Surj Sandel tells us about the HM Revenue & Customs tax specialist programme. We also hear about the work of the Records Review team at the Department of Health's Departmental Records Office and the usual exciting stuff from CS Local North West including coverage from Civil Service Live 2017. If you have any feedback or would like to feature an article in a future issue, please contact one of the editorial team. Doorstep Library – even more rewarding than expected.